Grin is cryptocurrency that has broken into the cryptosphere just a few weeks back. If you aren’t aware of it, then I must say you are being too lazy. Grin crypto is based on MimbleWimble protocol- a protocol initially developed to solve the Bitcoin’s privacy and fungibility problem. And as always, anything that’s proposed for Bitcoin doesn’t get implemented directly because Bitcoin devs follow a very conservative approach to safeguard Bitcoin’s core protocol. To give you an idea about the conservatism and the difficulty of arriving at a consensus for implementing changes on Bitcoin, you may take the case of Segwit which was still a soft fork. While on the other hand, MimbleWimble will require a hard fork and significant updates in the Bitcoin’s core code that’s why one has to take steps cautiously, and that’s what Bitcoin dev has been doing. So, as a result, we have got Grin cryptocurrency which is an open source MimbleWimble implementation started recently. 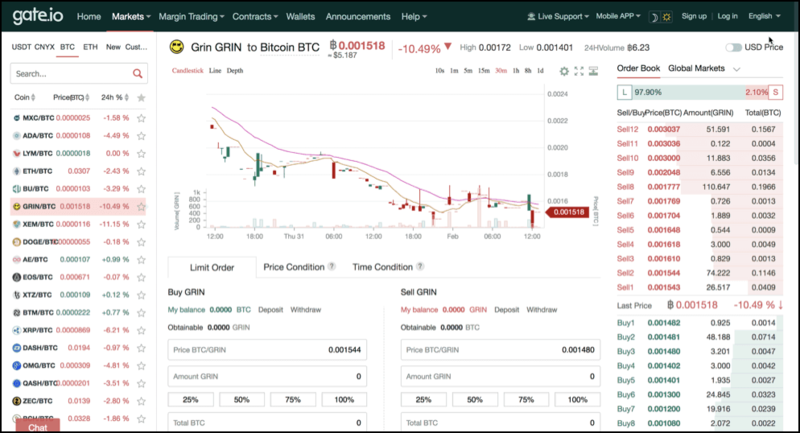 Grin mainnet was launched on January 15th, 2019. It’s very young, and experimental cryptocurrency developed openly, by developers distributed all over the world. But speculations are prevalent in the market that it is much better, secure and anonymous digital cash then Monero or Zcash and that’s why there are many interested buyers of Grin cryptocurrency. Grin Coin Exchanges: Where To Buy Grin (GRIN) Crypto? 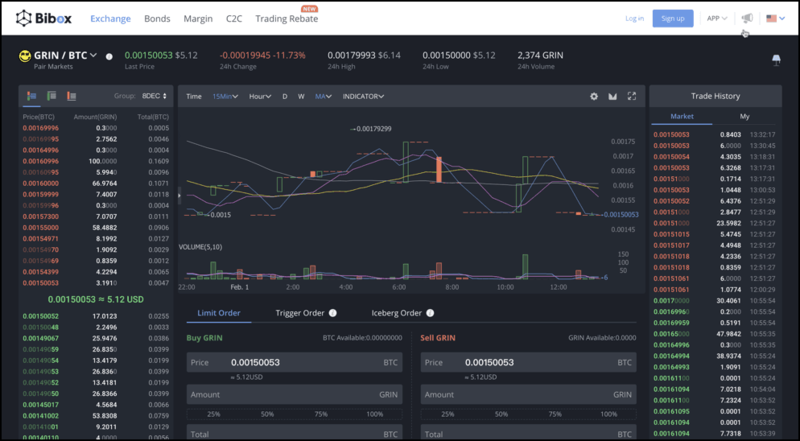 If you are someone who don’t want to get into KYC and all things to buy Grin, then you can look at centralized exchanges that sell Grin for other cryptocurrencies such as BTC, ETH, LTC, USTD, etc. Gate.io is a popular cryptocurrency exchange currently listing more than 300 cryptocurrencies/pairs for cryptocurrency traders. Gate.io has been here from last few years and has garnered community trust by introducing trading friendly UI as well as a special 10% trading discount. You can get this by subscribing to Gate.io using this link and believe me 10% trading discount can make a huge difference over a period of time. It also has a dedicated market for ETH, BTC, and USDT, that’s why getting started with Gate.io is easy because for a crypto-to-crypto exchange like this you don’t need do undergo KYC or verifications. And now the good news that Gate.io supports Grin trading, deposit, and withdrawal. Lastly, the overall trading fee on Gate.io is 0.2%, but you can get a 10% off on it. KuCoin is famous as ‘People’s Exchange’ in the cryptosphere, and it is also because currently, it is trading +400 cryptocurrencies on its platform. KuCoin started getting traction in 2017 just after Binance ICO because it was the second exchange that had a native token for its exchange. The good thing about its native token is that you can get a trading fee discount of up to 30% for using KuCoin and KuCoin Shares (KCS tokens). Bibox is another good Binance alternative, and on the first look, you will find it that it is inspired by Binance exchange only. And just like Binance exchange Bibox has native token called BIX which is used on the exchange to give a rebate to cryptocurrency traders. Bibox has a trading fee of 0.1 % on which also you can get up to 50% discount depending upon how much BIX tokens you hold and when you joined Bibox. 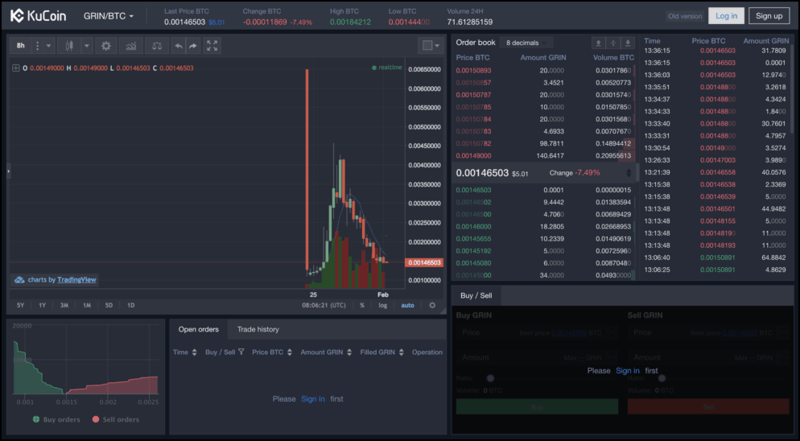 But for now the good thing is Bibox has listed Grin coin, so anyone interested in buying/selling Grin can head towards Bibox platform which quite user-friendly also. Conclusion: How To Buy Grin (GRIN) Coin? So these were the some of the options through which you can buy Grin coin but as of now buying/selling Grin for BTC/ETH and USDT is only possible. But untill these options become available, I think the above-listed services are enough to cater the market because Grin is fairly new cryptocurrency and only a handful of crypto people know about it. Having said that, as and when new legitimate services list Grin, we will also update this list of avenues through which investors can buy Grin coin. Lastly, if you plan to hold Grin for a long term then consider getting it transferred to a decent Grin wallet because all these services aren’t suitable for storing cryptos !! So that’s all from our side in this detailed guide on how to buy Grin cryptocurrency? Hope you liked it? Please do share it with your friends who want to buy Grin cryptocurrency ! !